Gillian A. Hotz, PhD is a research professor at the University Of Miami Miller School Of Medicine and a nationally recognized behavioral neuroscientist and expert in pediatric and adult neurotrauma, concussion management, and neurorehabilitation. Dr. Hotz is the director of the KiDZ Neuroscience Center, WalkSafe and BikeSafe programs, and has been co-director of the Miller School of Medicine’s Concussion Program since 1995. She continues to assess and treat many athletes from Miami-Dade County public and private high schools, University of Miami, and from other colleges and the community. The aim of this study was to use technology to improve participant’s knowledge about concussions. The study also collected attitude and behavior data regarding concussions. During the 2015-2016 football season, three high school football teams were presented with a comprehensive concussion education video. A student iClicker response system were used to answer concussion-related questions during pre-, post-, and 3-month post-testing periods. In addition, a set of attitude and behavioral questions at the 3-month post-testing period were added. Athletes who participated in all testing periods were included in the analysis. The use of a concussion education video and iClicker response system were beneficial for improving concussion knowledge. However, it had minimal effects on symptom-reporting behavior for high school football players in Miami-Dade County. Further research is needed to evaluate the impact of concussion education programs and the best methods of dissemination. Future studies should evaluate the team culture and prevailing attitudes on reporting symptoms. Educating high school student-athletes on preventing and identifying concussions could be useful in reducing the number of concussions in high school sports and time between injury and full recovery. 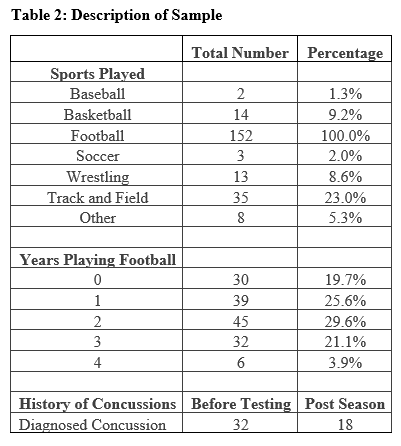 Keywords: Sports-related Concussions, Concussion Education, High-School Football, Concussion Attitudes. Sports-related concussions continue to be a public health concern due to the increased prevalence of head injuries across all competitive levels in football, particularly in high school and youth sports. With more than one hundred and ten million viewers in the United States that watched Super Bowl LI, the opportunity to educate players and their communities about sports injury resulting from contact and collision sports is justified (1). The Centers for Disease Control (CDC) estimates that 1.6 to 3.8 million sports-related concussions occur annually in the United States (2), with 21% occurring in high school sports (3, 4). Concussions, according to the Zurich 2012 Consensus Statement on Concussion in Sports (5), have several common features that incorporate clinical, pathological, and the biomechanical injury. Concussions can have serious short and long-term effects on an adolescent’s developing brain. This is due to different physiological responses and the specific risks (e.g., diffuse cerebral swelling) related to head impact, which can slow the recovery process (5). The unique, increased susceptibility of injury to the high school student-athlete relates to a number of factors: the immaturity of the adolescents’ central nervous system, the lack of recognition that a concussion has occurred, and the reliance upon subjectivity associated with self-reporting of symptoms (6). In addition, the concern that they may demonstrate cognitive and academic decline resulting in decreased performance in the classroom. In this study, the UConcussion program utilized an educational video to promote primary prevention of concussions among high school football players by aiming to affect behavioral change and reporting of possible head injuries. Primary prevention of concussions in high school football is employed while attempting to alter behaviors or exposures that can lead to injury. Specifically, educating high school football players helped us target behaviors within the sport that are innate to an athlete playing football. While planning the program, we assessed the educational needs of high school football players’ concussion safety, how they perceive an injury, and what type of steps they should take after an injury. This population was targeted since studies showed that some youth athletes’ believe concussions pose little danger to them, and/or they are motivated to not be withheld from competition (7, 8). Following a possible concussive injury, an athlete is removed from play so that they do not sustain another impact while symptomatic, when the brain is most susceptible to additional trauma. The fatal, but rare occurrence of Second Impact Syndrome (SIS), further emphasizes the importance for athletes to self-report symptoms for evaluating a concussion following a suspected head injury(9). The need to provide concussion education prior to a sports season is now among the discussions in high school programs. Register-Mihalik et al (10) found in a cross-sectional survey of high school athletes who reported better knowledge about concussions in sports, increased reporting of concussion symptoms. Additionally, a second cross-sectional survey reported significant knowledge gain among athletes that received concussion education were more likely to stop playing and report symptoms if they experienced a concussion (11). The implementation of the Countywide Concussion Care Protocol (CCCP) (12) in Miami-Dade County (MDC) provides the UConcussion program the opportunity to work closely with all thirty-five public high school football teams and to educate and train certified athletic trainers (ATs) in the county. Coaches, parents, administrators, athletes, and physicians are relevant targets at this level to foster a behavioral/cultural change in an environment dominated by misinformation and underreporting. With so many people associated with the players involved, having a singular one-size-fits-all approach would have undermined the strategies devised to meet the learning style and preferences of the MDC high school football culture (13). South Florida high school football is regarded as one of the hotbeds for national recruiting of college football players. The emphasis placed on every school, coach, and player to practice and prepare for a season is nearly year around. Almost every month of the year is planned for football related activities to some degree. Devising a plan for each of the thirty-five athletic department’s football programs and the ability to schedule the time to provide concussion education without underscoring the unique needs of each school, proved challenging as discovered in our previous study: The challenges of providing education to high school football players (14). In this follow-up study to Hotz et al (14), observations and discussions by athletic departments were made to find a better delivery system in which the athletes would prefer to receive concussion education in a more concise and stimulating format. In a recent survey, approximately 94% of teenagers who had Internet access reported they use the Internet for school research, with 78% reporting the Internet helps them with their school work as schools have also embraced the Internet as a tool for learning(15). Approximately 77% of instructional classrooms have internet connections, with the number dropping to 60% for schools in low-income areas (16). Due to the high volume of students using the Internet as a means of receiving information and ease of accessibility, the UConcussion program created an online educational video about concussions, which is utilized in congruence with iClicker response system to test a student-athlete’s concussion knowledge and collected data about behavioral change and attitudes. Three MDC Public High School football teams, who have not previously participated in the UConcussion education program, participated in this study. Two hundred and thirty-eight male football players, from 13 to 18 years old, were enrolled in the study. Participation in youth football by the student-athletes were not taken into account. UConcussion created a 15-minute education video to provide high school athletes in MDC with an online resource for learning about concussions. Content was derived from the Sports legacy Institute Concussion Education program (SLICE) curriculum (17), with modifications of information to better target participants. The video includes; defining a concussion, the signs and symptoms associated with a concussion, identifying a concussion, state legislation regarding concussions, and the current knowledge and effects of Chronic Traumatic Encephalopathy (CTE). The video was created on February 3, 2015 and can be accessed via YouTube (18). The iClicker response system collected data from the student-athletes during each test point. The iClicker is a radio frequency classroom response system that enables instructors to poll students and receive immediate feedback. Instructors receive a kit consisting of a wireless receiver, a USB with the program installed, and a remote. Both the program and wireless receiver are plug-and-play compatible. Students are able to answer the question with their mobile device or iClicker remote. For the purposes of this study, all questions were programmed in a PowerPoint presentation prior to the presentation and students were given an iClicker to answer questions. The knowledge assessment questions used in this study were previously used in another study (14). Tests were designed to assess a student’s knowledge on concussions. An identical set of demographics and 10 multiple-choice questions were presented across all three testing periods. In addition, a set of attitude/behavior questions were administered following the three-month post-test. The AT at each study school were contacted prior to the start of the high school football season. The first of two visits were conducted prior to the start of the football season, with the administration of a pre-test, the 15-minute video presentation, and a post-test. Projectors in a large classroom or auditorium were used to show the video and administer the questions, which were shown sequentially in numerical order. Upon entering the testing room, the iClicker response system remote were given to each football player. Once seated, the football players were instructed on the use of the remote. Instructions at the bottom of each question from the PowerPoint presentation were provided to remind the student athletes how to use the remote to answer the question. Due to the limited number of remotes available and size of the football teams, two of the three schools were divided into two groups. At the start of each test, students were instructed to enter a unique identifier that consisted of their initials and football number. All responses to a question were submitted prior to moving on to the next question and were electronically scored by the iClicker response system and exported to Research Electronics Data Capture (RedCap) (19). Teams received a second visit at the end of the regular season and were administered the three-month post-test and the set of attitude/behavior questions. Approval for this study obtained from the Miami-Dade County Public School Department of Athletics and University of Miami Institutional Review Board. Responses to the assessments at all testing points were entered into RedCap and analyzed using IBM Statistics SPSS 22. Comparison of mean test scores were assessed using a repeated-measure ANOVA. Frequencies of responses to each attitude questions were used to measure the differences between answers to the eight questions. The Pearson Chi-Square Test of Independence examined the relationship between student-athletes at each school and the responses to the attitude questions. Descriptive statistics were used to summarize demographic data and concussion history for all participants. A total of 152 subjects from three high school football programs completed useable baseline, post-test, and three-month post-testing assessments. 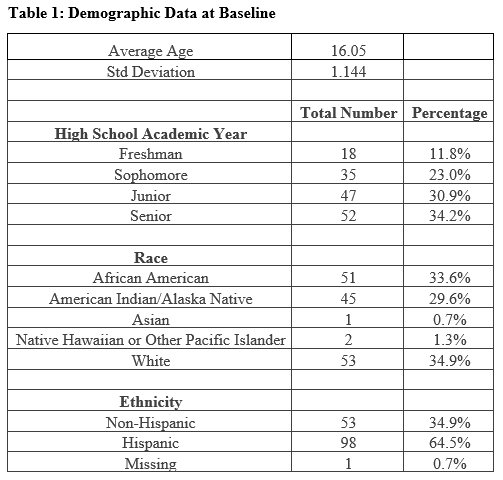 Table 1 and Table 2 show a breakdown of the demographics of those participants included in the analysis. A repeated measure ANOVA resulted in a statistically significantly difference for the mean score between time points (F (2,302) =6.810, p<0.002). Post hoc tests revealed that the concussion education video resulted in a statistically significant increase in mean test scores from baseline testing to post-testing (MD=0.283, p<0.034) and non-significant increase from post-testing to three-month post- testing (MD=0.178, p=0.525). Table 3 shows the results of the ANOVA. Of all the questions, one question showed a significant increase in percent correct from baseline test to follow-up testing. About 70% of participants were able to correctly identify that CTE is not temporary at the three-month post-testing, which was a 35% increase from baseline testing. No other questions from the study showed significant changes. Table 4 shows the results of all three testing periods. 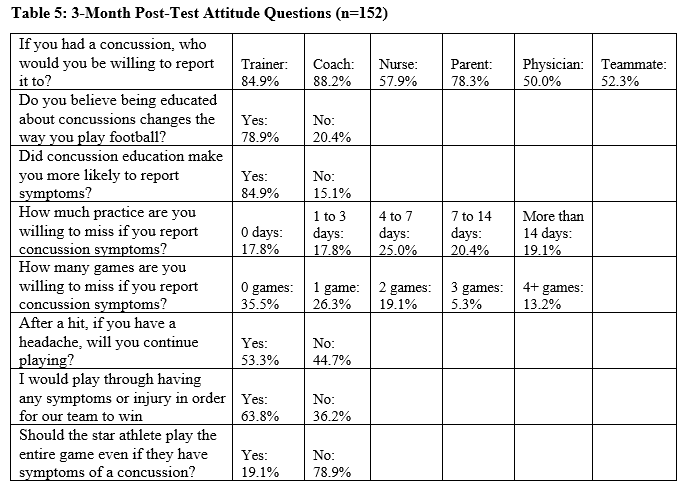 The results of the attitude questions taken at three months post-testing for all the participants in the study are shown in Table 5. Notable results from the attitude questions include the willingness to continue playing after showing symptoms of an injury (63.8%) or when having a headache because of a hit (53.3%). Additionally, more than a third of the participants (35.5%) are not willing to miss any games if they report symptoms, even though 84.9% of participants report that being knowledgeable on concussions would make them more likely to report symptoms. A Pearson Chi-Square test examined the relationship between schools and the results of each individual attitude question. Five questions had statistically significant differences between the student-athletes at each school (Table 5). Student-athletes at School 1 and 3 were willing to miss more practices (X2 (8) =30.061, p=0.005) and games (X2 (10) =26.935, p=0.003) after reporting concussion symptoms than School 2. School 1 and 3 were also more likely to continue playing after having a headache following a hit (X2 (4) =12.327, p=0.015) and to play through symptoms or an injury (X2 (2) =9.089, p=0.011). Lastly, student-athletes at school 1 and 3 reported that the star athlete should not play the entire game if they have symptoms of a concussion (X2 (4) =18.391, p=0.001). The focus and attention on concussion research has shifted public interest to high school athletes that sustain concussions. High school athletes have historically lacked the ability to recognize the signs and symptoms of concussions. This has caused an underreporting of head injuries, making athletes more susceptible to further injury and prolonged symptoms. This highlights the need for high school athletes to be educated on concussions (5, 20). Previous work evaluating the impact of a shortened and modified SLICE presentation on high school football players in MDC demonstrated minimal benefits in concussion knowledge; however, multiple limitations to the study influenced the results (13). A one to one test score comparison, use of iClickers, and a short video presentation were employed in this follow-up study to respond to previous study limitations. Overall, our findings demonstrate that the use of the iClicker response system and the concussion education video were beneficial for improving concussion knowledge. However, the video had minimal effects on symptom reporting behavior for high school football players in MDC. 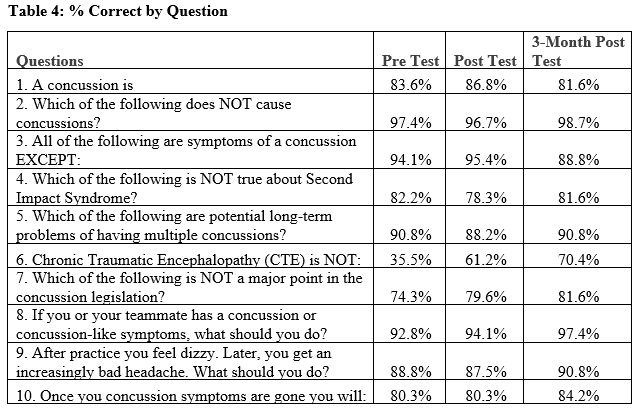 The statistical improvements in overall group concussion knowledge from pre-testing was due to the significant increase in correctly identifying what is not associated with CTE (Table 4). The overall group mean pretest scores suggest most participants may have been previously educated about concussions or the degree of difficulty of the test was not appropriate. The majority of participants reported that concussion education changed the way they approached playing football (78.9%) and were more likely to report symptoms (84.9%). However, when asked if they would play through a headache after a hit, over half of the football players (53.3%) reported they would. The majority of football players were also unwilling to miss more than 14 days of practice (80.4%) or three games (86.8%), even though they are still experiencing symptoms. Additionally, reporting behavior inversely correlated with a team’s record. School 1 and School 3 posted losing records, while School 2 went undefeated in the regular season and reached the playoffs. Players at School 1 and School 3 were more likely to report symptoms than the players in School 2. These findings suggest that other factors are likely influencing football players in their reporting behavior. The sports culture, attitudes, internal and external pressure, concussion history, perceived outcomes, norms, and policies could also influence concussion symptom reporting (19, 21-22). A future study evaluating the multiple social factors would provide a greater understanding of concussion reporting behaviors in high school athletes. There are benefits to utilizing technology in presenting and evaluating concussion education programs. The concussion education video provides an accessible standard presentation for widespread use for any group size, which can be viewed online at any given time. Animations and video excerpts demonstrating the effects of a concussion can be more evident through a video than a speaker presentation. For example, the video demonstrates an actual clinical examination of a former professional football player. The effectiveness of the video is measured in real-time. The answers are given electronically and analyzed on site. This also negated the use of paper, grading surveys by hand, and data entry errors. There are some limitations in this study. Although students were instructed to answer all questions independently, the testing environment may have facilitated some collaboration between students. This may have negatively or positively affected test scores and attitude responses. While the sample size in this study is acceptable, a larger population would have provided greater evidence of the impact of concussion education on knowledge and behavior. Though these three high school football programs did not receive any concussion education from UConcussion, the football players were not screened to determine if they received any other education prior to the start of the season. This could account for the high pre-season scores and undervalue the impact of the video intervention. A change in attitudes and behavior could not be measured as they were not measured at baseline. In addition, this study did not include a control group. Concussion management policies and legislation for high school athletes have slowly progressed in recent years across the country, particularly for football. Administrators in the Department of Athletics for MDC public high schools have implemented policies that have improved recognition and awareness of concussions. This was accomplished by emphasizing regulations to address primary concussion injury prevention in high school protocols and league wide policies, thus reducing the burden of concussion injury among high school athletes. Students that participate in contact and collision sports such as football will require different approaches towards education to reduce risk associated with head injuries. The UConcussion program showed marginal increases in concussion knowledge by integrating a classroom polling system and an educational video during the pre-season. Although further research is needed to validate the impact of concussion education programs for athletes, all athletes playing contact sports should receive some kind of education that explains the symptoms and associated risks. We must continue to understand high tech platforms and how education should convey the most beneficial way to educate a group of high school football players. Future studies should also evaluate the team culture and prevailing attitudes that influence reporting concussion symptoms. Establishing an effective program that is theory driven and systematic has enhanced our ability to target the conditions predictive to our audience of high school football players. Engagement of their attention is key to delivering any type of program (23). The feedback received from coaches, parents, players and administrators about the concussion video education program have been positive. The UConcussion program will continue to evolve, and improve the concussion education programs reflecting the body of knowledge supporting brain injury policy and education. Educating high school student-athletes on preventing and identifying concussions could be useful in reducing the number of concussions in high school sports and time between injury and full recovery. Medical professionals, athletic trainers, and school staff should collaborate to provide the appropriate education to student-athletes, especially those in contact sports, to understand the impact of concussions. The authors would like to thank the UHealth Sports Medicine Clinic and Staff, Cheryl Golden, who was the Director of Athletics for the Miami-Dade County School Board and all the Miami-Dade County Certified Athletic Trainers. We would also like to thank the Concussion Legacy Foundation for the use of their SLICE program, and the Countywide Concussion Program for their continued support. 2. Centers for Disease Control and Prevention (2011). Nonfatal traumatic brain injuries related to sports and recreation activities among persons age <19 years—United States, 2001-2009. MMWR Morb Mortal Wkly Rep. 60(39):1337-1342. 3. McAvoy, K. (2012). Return to learning: Going back to school following a concussion. Communique,40(6), 23-25. 4. McAvoy, K., & Werther, K. (2012). Colorado Department of Education Concussion Management Guidelines. 6. Theye, F., & Mueller, K. A. (2004). “Heads Up”: Concussions in High School Sports. Clinical Medicine and Research, 2(3), 165–171. 7. Meehan III, W.P., Bachur R.G. (2009) Sports-related concussion. Pediatrics, 123(1) 114-123. 9. McCrea H.J., Perrine K., Niogi S., Hartl R. (2013) Concussion in sports. Sports Health, 5, 160-164. 12. Hotz G., Quintero A., Crittenden R., Baker L., Goldenstein D., Nedd K. (2014). A Concussion Program to Manage Concussions in High School Sports. The Sport Journal. 14. Hotz G., Crittenden R., Siegel J., Duerr, E., Hurley, E., Pagan, E., Baker, L., Golden, C., Cade, W., Nedd, N. (2016). The challenges of providing education to high school football players. Curr Res Concussion, 2, 103-108. 16. Cattagni A., Farris E., (2001). Statistics in Brief, Internet Access in U.S. Public Schools and classrooms: 1994-2000. National Center for Education Statistics. Available at: http://nces.ed.gov/pubs2001/2001071.pdf. 23. Committee on Sports-Related Concussions in Youth; Board on Children, Youth, and Families; Institute of Medicine; National Research Council; Graham R, Rivara FP, Ford MA, et al., editors. Sports-Related Concussions in Youth: Improving the Science, Changing the Culture. Washington (DC): National Academies Press (US); 2014 Feb 4. 1, Introduction. Available at: https://www.ncbi.nlm.nih.gov/books/NBK185343/.